I had the most beautiful looking, healthy dessert/breakfast cheesecake tart thing with a maple leaf made out of strawberries on top that I was going to share with you today. This isn’t it. In case you missed that. It was a little disappointing, I must say. I was so proud of myself for actually making a cutesy holiday type food to share for Canada Day. And it was cheesecake but healthy enough to have for breakfast. AND I managed to make a maple leaf that actually kinda sorta looked like a maple leaf out of strawberries on top. But….it just wasn’t that good. I mean, we ate it. And the kids actually really loved it. But my husband and I just thought – meh. And that’s not worth sharing. But it was so pretty, so I may need to make another maple leaf type thing for Canada Day next year. Stay tuned. I obviously couldn’t let the holiday pass without something all red and white and perfect for a party though. Plus, it’s really hot right now. So ice cream it was. Strawberry yogurt terrine to be exact. Much more dessert-y then my first thought for the holiday, and less healthy, but there’s still yogurt in it, and lots of strawberries, so not too bad as far as ice cream goes! And so red and white and pretty! Right? I’ve never made a terrine before. Hadn’t even heard of them until I started stalking food blogs a few years ago. Evidently it’s a thing. Of course, when I googled “terrine” just to make sure I was spelling it right, all I found was “French forcemeat loaf similar to a pate”. Um…. no thanks. Maybe it’s good – I like pate, but it really doesn’t sound like something enjoyable! So maybe “terrine” is not what these ice cream loaves are supposed to be called, or maybe it’s just what people started calling them since they’re made in a loaf pan. Whatever the case may be, they’re delicious. And oh so easy to make. I may just be making them incessantly this summer – because, so many combinations to try! 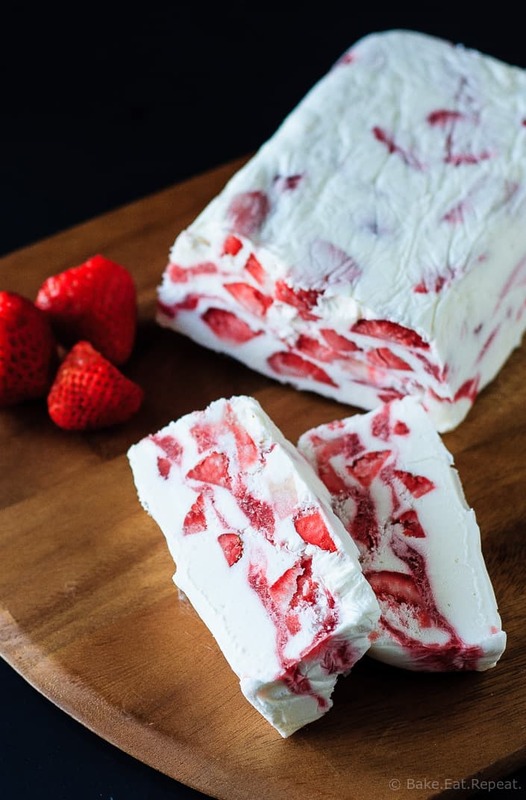 For now though, this strawberry yogurt terrine is pretty amazing, so we will be enjoying this creamy, cold dessert on Canada Day next week. Red and white and so, so tasty. And for my American friends, just add some blueberries and you have the perfect red, white and blue dessert for the fourth of July! Also, you should probably drizzle melted chocolate over it. It’s not red or white (or blue), but it’s pretty awesome. Note: To make 1/2 cup strawberry puree, simply blend 1/2 - 3/4 cup chopped strawberries in a blender until pureed, adding a bit of water if necessary. Line a loaf pan with plastic wrap, leaving a large overhang to make it easier to remove the terrine when it’s frozen. Set aside. In the bowl of a stand mixer, or with an electric mixer, whip the heavy cream and plain Greek yogurt together until soft peaks form, 1-2 minutes. Scrape the sides of the bowl, and continue to whip on low speed while slowly adding the sugar. Continue beating until stiff peaks form, about 1 minute. With a rubber spatula, gently fold the chopped strawberries into the whipped cream. Spread one third of this mixture in the bottom of the prepared loaf pan. Spread half of the pureed strawberries on top of this. Repeat with another third of the whipped cream, the rest of the strawberry puree, and the last third of the whipped cream. Smooth the top of the terrine and cover it with plastic wrap. Freeze until solid, at least 6 hours. 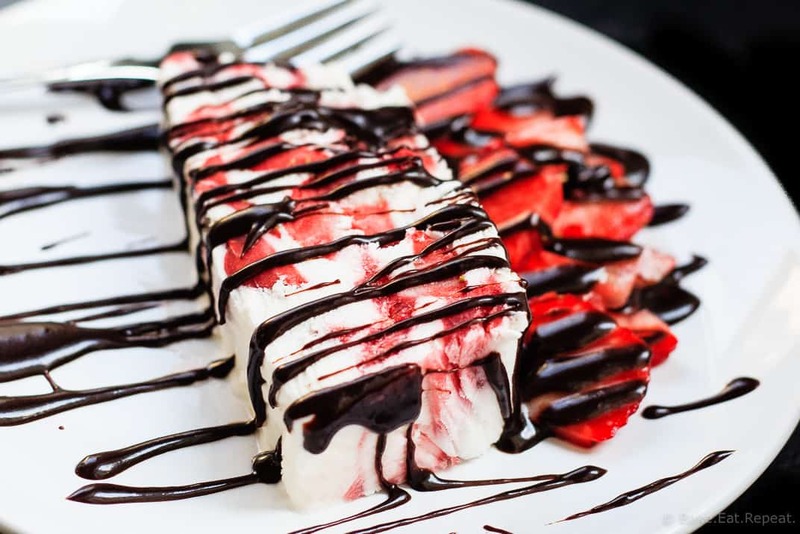 Slice with a hot, sharp knife and serve cold with sliced fresh strawberries and drizzled chocolate if desired! I hate that, when I make the PERFECT recipe and then it just doesn't make the cut. So frustrating! But this is so pretty! SO frustrating right? Oh well, incentive to make it better I suppose! :) Thanks Dorothy! I don't know if this could get much prettier. It looks like a perfect summer dessert! Looks fantastic! I'm sure you'll be able to create another special flag tribute next year. That's the plan! :) Thanks Laura! I want to eat this all day, every day! Looks amazing! Hahaha, yeah, ice cream all day every day would be pretty fantastic! :) Thanks Andi! Thanks Mir! You gotta go with the right colours, just more fun that way! :) Have a great holiday weekend! Bummer!! Don't you hate a recipe fail? Sounds like it wasn't really too much of a 'fail', but I know what you mean when something is just 'okay'. Not worth posting. But this terrine looks amazing! So refreshing and summery. I love it! Thanks Sarah! Yeah, recipe fails are so annoying. It was really just the crust that was no good though, so it was fixable - just not in time for Canada Day! It's so disappointing when you have awesome pictures and a not so amazing recipe. I'm sure you'll perfect it though sounds pretty amazing! Sorry to hear about your cheesecake tart - hate it when that happens too. Love that you shared this terrine! It looks gorgeous and so delicious! Hi. I am in culinary school and we recently made terrines. They are actually pretty good, it just depends on your recipe and creativity level. With that being said, this is absolutely the perfect dessert!! Just one thing to remember for those trying to make one for the first time, you build them upside down. I have to make a dessert for upcoming quarter when we make and serve menus for our restaurant, I would love to use this one! I always see pretty pictures of terrines in magazines but I've never actually made one before. Yours looks amazing! This is the first time I ever tried one too, and I'm now wishing I hadn't waited so long. They're so easy! Thanks Sara! This is such an easy and delicious Summer recipe. I love how surprisingly healthy it is too, whilst still being pretty indulgent. I'm sorry to hear about your beautiful maple leaf tart! But this one is equally as gorgeous! And plus, ice cream. Lol. Love! Can't go wrong with ice cream, so it's all good! Thanks Ashley! This terrine looks delicious! Perfect for the holiday! Cheesecakes could be tough, especially, when I want to make them of the blog :) Pinned! It's always when you want something specifically for the blog that it doesn't work out hey? So annoying. Oh well, try again! Thanks Mira! This looks spectacular! Red, white, and chocolate seem patriotic enough to me, no matter which side of the border you're on. Have a great weekend Stacey! It's true, red and white works for both countries! Thanks Jim! I know hey? Insane that it's almost July! Thanks Denise! Wow! Wish a had a slice of that in front of me right now! Sorry the cheesecake didn't turn out great! I hate when that happens! This terrine looks gorgeous, I need to make it soon! So annoying right? Especially when you think something will be great! Oh well, this terrine was! Thanks Manali! Actually the cheesecake part was great - it was the crust. I tried a healthy date/pecan crust and we just weren't fans. Although it was nice giving the kids "dessert" after school - they thought they were having some treat when it was healthy enough for breakfast! Might need to work on it to make it so we like it too! But this was great so it all worked out! :) Thanks Cyndi! OMG YES! I want this for dessert tonight! This reminds me of that Breyers Vienetta dessert! Do you remember those? But yours is a fruity kind! Love this, pinned! I have no idea what the vienetta dessert is, but I want to! Maybe it wasn't in Canada? Or I just never had it! :) Thanks Jen! So cool that you made this with greek yogurt, it look like ice cream! 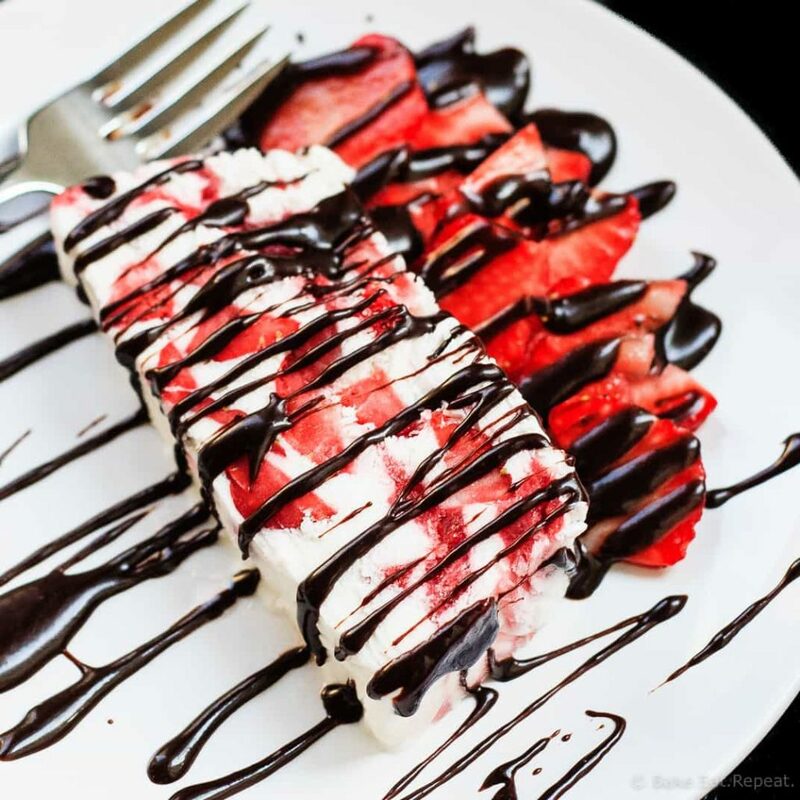 Love it, and those fresh strawberries and the drizzle of chocolate are so perfect. It was a little bit harder and not quite as creamy as regular ice cream, but still pretty much tasted like ice cream, even with half yogurt in it. I was pleasantly surprised! Thanks Katalina! I've never made a terrine before either, but now I totally want to - this looks delicious! Such a perfect treat for summer! I love strawberries, definitely my favorite fruit! Mine too, we go through them like crazy in the summer! Thanks Cate! I hate that! When something looks great but just isn't that tasty! Such a bummer. But this! This is gorgeous! I've never made a terrine before but I think it's time I start! So easy and so pretty - I'm almost glad the tart didn't work out cause it made me make this! And it was really good! Thanks Ashley! Cheesecakes are always so temperamental! This terrine looks amazing, Stacey! It's so pretty, especially with that chocolate on top. And I love the simple ingredients too. Sounds perfect! The funny thing is, the cheesecake part was great - but I tried a healthy crust made of dates and pecans that I saw in another recipe and we did not care for it - kind of chewy. So the crust I need to work on - with a regular crust it would have been great. Shouldn't try to make stuff too healthy I suppose! Thanks Gayle! Sorry that your maple leaf cheesecake didn't turn out. There's always next year! This terrine sounds pretty great. I have yet to try terrine but I'm thinking I need to soon. Yep, definitely working on it again next year! You definitely need to try it, so easy and so good! Thanks Jen!